Willow Wax Craft pulled me in recently with their lovely branding, interesting blends and I also enjoy that Samantha, the owner, features indie perfume companies on her IG feed. I browsed and ended up with four scents, Samantha sent me a conversation letting me know she had a four pack bundle discount and refunded me some of my payment. It was unexpected and appreciated. I ordered on the 31st of August and it arrived September 5th. Four clamshells were $18.68 and shipping was $8.15 plus I had 15% off for Etsy's first ever Labor Day sale. Everything came packaged beautifully in a small flat rate box. The clamshells were wrapped in brown paper and sealed with fall leaf washi tape. The free samples were packed in a stamped muslin bag and there were even scent list cards for reference (LOVE!). 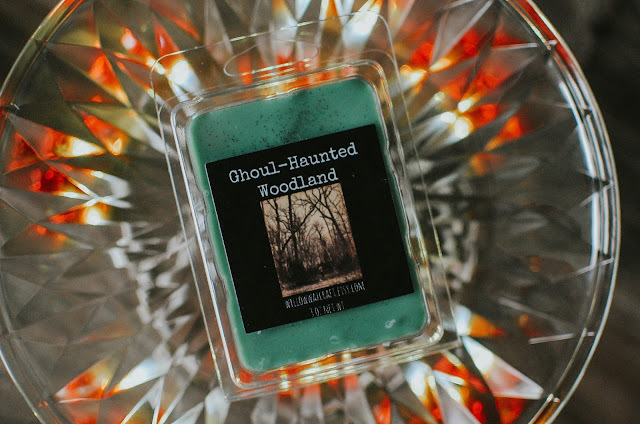 Ghoul-Haunted Woodland- A dreamlike walk through gloomy woods one lonesome October night- propelled by spirits or demons- where? Cool, shadowy conifers, a hint of rain, withering leaves, apples and lavender. A beautifully written description that recounts a cool fall day. A touch of aquatic ozone in the atmosphere speaks of chilled mist floating above the forest floor, woods and herbs dapple the scene with their greenery and a hint of sweetness from the ripe wild apples round it out. Two cubes threw medium-light in the large kitchen and living area. 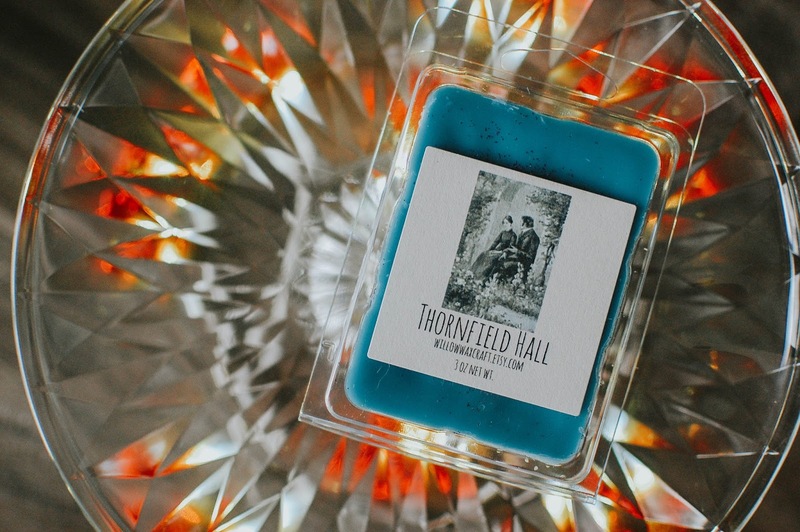 Thornfield Hall- A stately, elegant blend of rosewood and musk, paired with pale pumpkin and wild lilac. This bird can't be caged. I was sold on the rosewood and musk married to the pumpkin. And the rosewood does not disappoint. Thornfield Hall is paneled with rosewood in abundance, its glowing polished wood gleaming from the walls and floor. Puffs of lilac bushes nod against the windows and delicately perfume the mansion's air. The pumpkin does not translate literally but does seem to add a darkness to the hall. Some lowlight depth. As a huge lovers of rosewood this one is a win in my books. Two cubes threw medium in the living area and kitchen. Libraries, books and pumpkins? My Hermione heart quickens at the mention of these favorite things. The leather's voice comes across the most distinct but this is a nice leather, not plasticy or overbearing but soft, smooth and supple. It is mellowed by the hint of smoke and green herbs. I do wish the pumpkin would come out to play a touch more. Two cubes threw medium-light in the kitchen and living area. 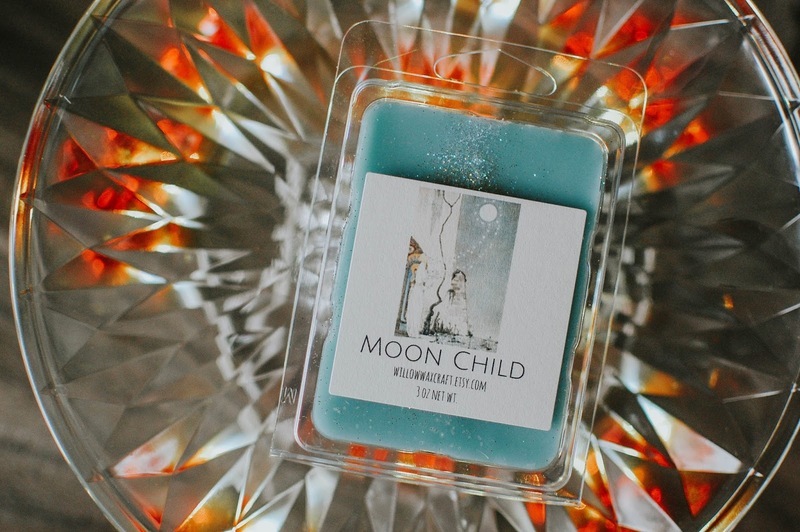 Moon Child- The most vast of empires can arise from a single grain of sand- do what you dream and start wishing. An ethereal blend of rich vanilla, oak, rosewood, vetiver, smooth amber and musk. I love this scent. It is a smoky vanilla woods that screams to be melted. I am going to hold on to it for a touch longer and see if maybe with some curing it will be a touch stronger than the other three I have melted up to now. I seriously am digging this scent. Free samples included two wax cubes and two Japanese candies. Love me some Japanese candies. Harvest Hayride smells of apples, fruits and sweet hay and soft earth. A pleasant scent that will melt nicely in the bathroom wall plug-in warmer. Balm of Gilead is scented in the vintage tones of violet cosmetics, lipsticks and powders. It reminds me of a few Sixteen92 perfumes. Another cool scent to melt in the bathroom. Overall I am happy with my first ever Willow Wax Craft order. I thoroughly enjoy the branding and scent blends, the discounts and customer service. The TAT is amazing and shipping is fairly reasonable. My only wish is that the scents were a touch stronger. It could be the blends I chose and it won't stop me from trying some more out. I have my eye on Sleepy Hollow Day (moss and woodsmoke! ), Mechanical Heart (copal?! awwww yes), Primeval Forest (cardamom, rose and cedarwood), Bonfire Stories and Stay Golden. 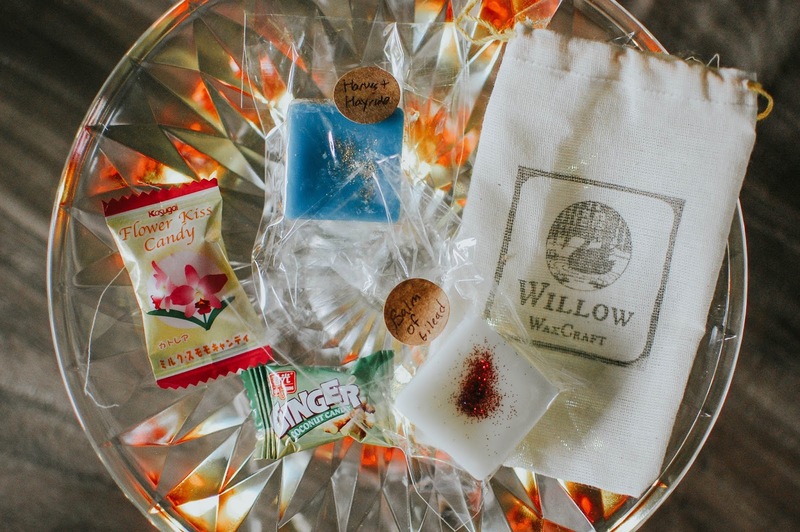 Have you tried Willow Wax Craft? Any I need to try? 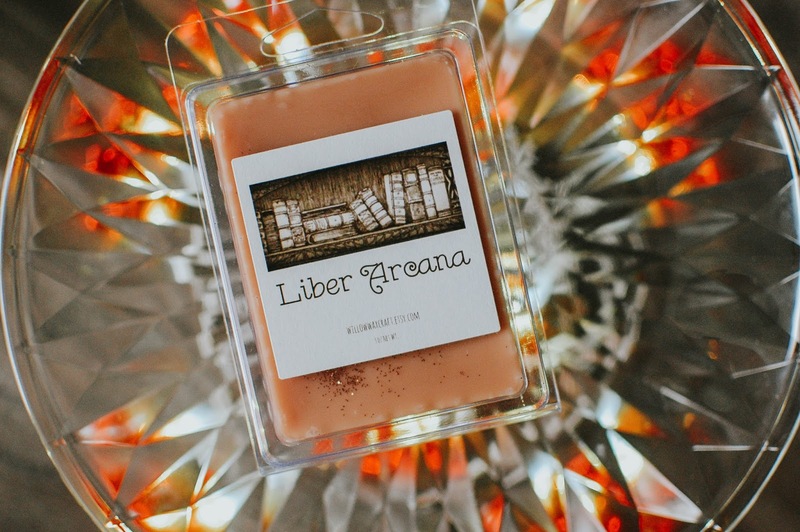 Honestly, I skimmed because I didn't want my thoughts influenced on the two scents I also chose, Liber Arcana and Ghoul Haunted Woodlands. Your pics are lovely. I enjoyed all but one of mine, will let you know which ones I got that I think you should try. I'll definitely be reordering, love the style. Gah! I'm still all thrown by the same day mention of this vendor, I also took advantage of the Labor Day discount on Aug 31st. 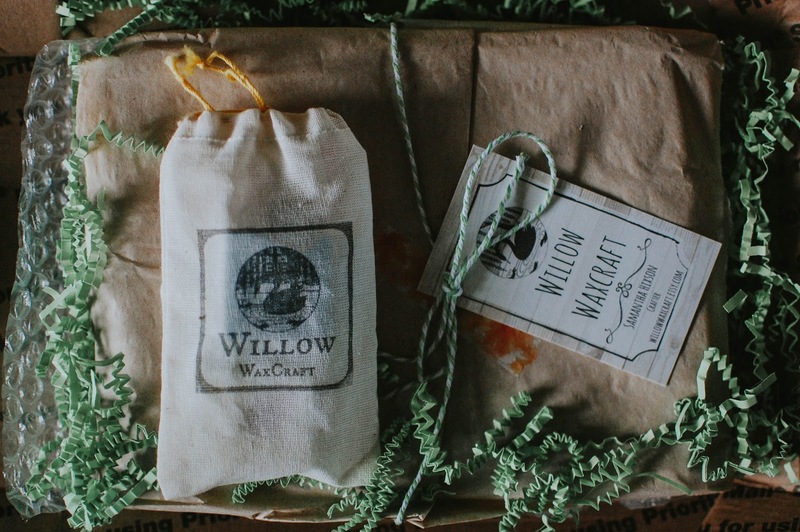 A little while back, I read your upcoming orders and I *think* you mentioned GoldWillow Wax, but I initially thought you said Willow Wax Craft and I remember re-reading and thinking phew! not the same, as if WWC was my own little discovery. Of course, as an indie perfume lover it makes sense WWC would be on your radar. 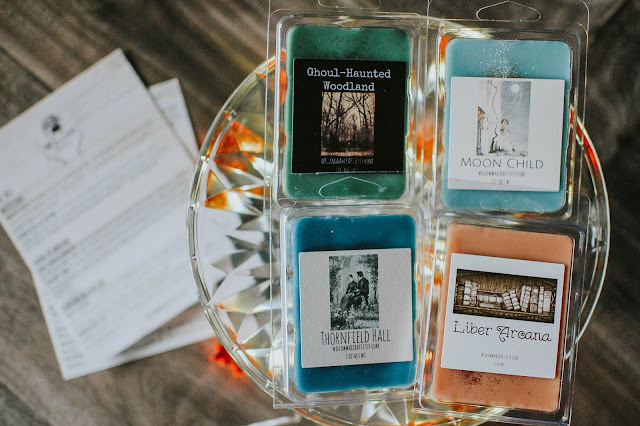 The designs and scent choice really spoke to me, I'll be ordering Thornfield Hall for a Eyre loving friend in the future. Here's to Willow Wax Craft and Samantha, I hope she does really well. Looking forward to reading your reviews on them. I loved the scents. I could have used a touch more throw but it is nothing that would stop me from ordering again. Perfect for smaller bedrooms too. I enjoy her styling as well. Too funny about us both ordering from her on the Labor Day Sale. Meant to be. I still have not bought from Golden Willow. I wouldn't mind but I have to be in a certain mood to spring for new vendors. That wild hair has to be there. I am a creature of habit more often than not. Ah yes, this vendor seems right up your alley. I'll be passing though, since these are not my type of scents, and the high price/light scent is a no-go for me. Totally up my alley. I am all about these evocative scents. I really and enjoying the cool blends. A touch more strength would put me over the edge into ecstasy. But as they are I am still pretty happy.